Insulation can save you BIG money on energy bills! Even though you don’t see it, insulation has real and significant benefits. In fact, insulation has a three times greater impact on the average home’s energy and comfort than windows or doors! 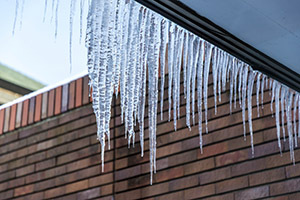 Ice dams like this on your home is a sign your attic needs more insulation. Contact us today to find out how we can help solve this very destructive problem. The US Department of Energy warns homeowners that just 1 in 5 homes constructed prior to 1980 are sufficiently insulated. While homes built today are required to meet minimum R-Value standards, this requirement was not included in building codes prior to the mid-1970s. This means that approximately 80% of homes built before this time are in need of better insulation! If you’re uncertain if your home falls within this category, contact us at 888.292.2382 to speak to one of our local insulation experts. Kinzler is your local insulation expert! Kinzler Construction Services has more than three decades of local insulation install experience. We’ll work with you to examine different areas of your home and identify cost-saving solutions. The videos below talk briefly about what to consider. The attic is usually where you can find some of the largest opportunities to save energy in your new home. Garage insulation helps to stop air leakage, heat transfer, health threats, and most importantly, it saves on unnecessary energy costs. Now that you know more about how insulation affordably keeps you and your family comfortable year-round, it’s time to contact us by requesting a free estimate or talking to one of our experts by calling 888.292.2382. Together, we’ll come up with the custom solution that’s just right for your home! Call us at 888.292.2382 or fill out the short form below. Understand R-Value and how we determine if you have enough insulation in your home.